What’s not to love about Valentine’s Day? This holiday encourages showering family and friends with love, affection, attention, and even treats like crafts, cards, and sweets! 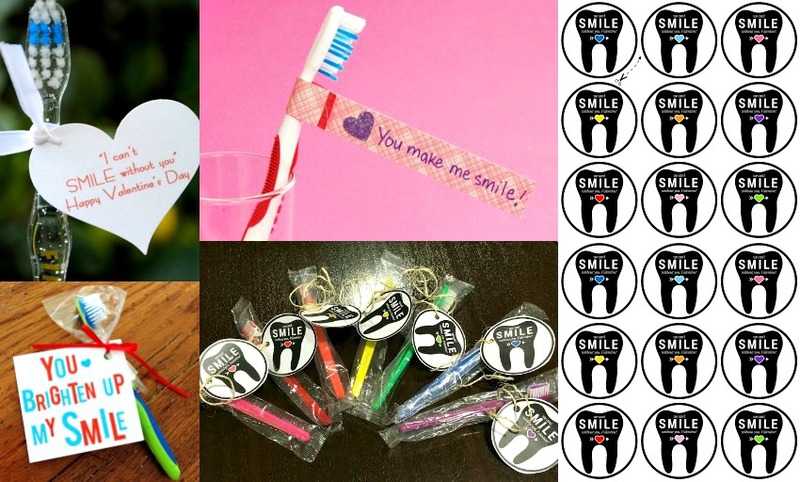 Patients, do you want to offer a token of appreciation for your healthy smile by leaving a valentine at your dentist’s office? Dental practices, do you want to send your valued patients home with a little something special this V-Day to let them know how much you appreciate their business? 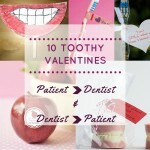 We’ve put together 10 “toothy” valentine ideas just for the occasion. 5 are intended to be given from patient to dentist, and 5 are meant for dentists to distribute to patients, but all 10 could easily suit both purposes. From ideas as simple as attaching a sweet sentiment to a take-home toothbrush, and as wacky as casting a chocolate mold of your mouth, we hope you enjoy our list! These construction paper cards would be perfect for the littlest patients to put together. All they require is pink or red colored paper to serve as the mouth, and “teeth” of the crafter’s choosing. Jumbo marshmallows make pretty convincing pearly whites and can easily be attached with liquid glue. A red tongue colored with crayons or markers completes this version of the card. If you don’t have mallows on-hand, raw veggies like full-sized carrot sticks or potatoes make perfect teeth stampers when dipped into white paint. Don’t forget to sign your name when everything is dry, so the dentist knows who to thank for this one-of-a-kind Valentine! 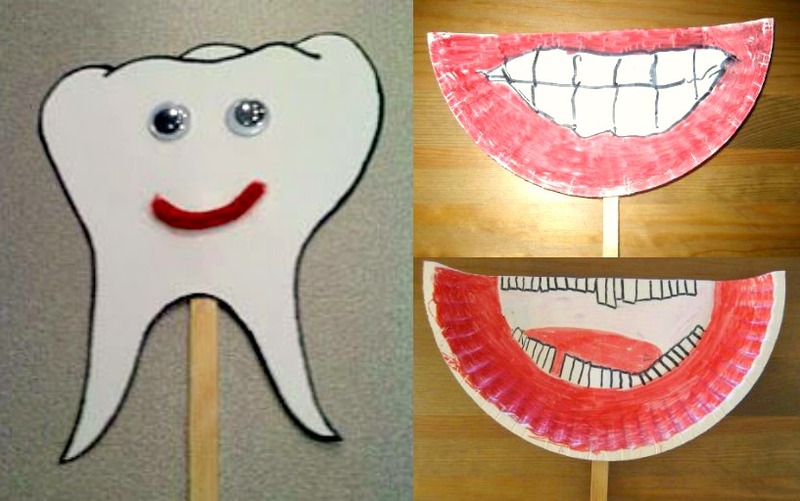 These interactive paper crafts on a stick are another great choice for the youngest pediatric dental patients to master. The craft on the left calls for white construction paper, a black marker, googly eyes, a segment of red pipe cleaner, and, of course, a Popsicle stick. Mr. Tooth can be adhered to the stick with Elmer’s glue. When he’s dry, he’ll be lots of fun to use as a puppet – we’re looking at you, front office managers! 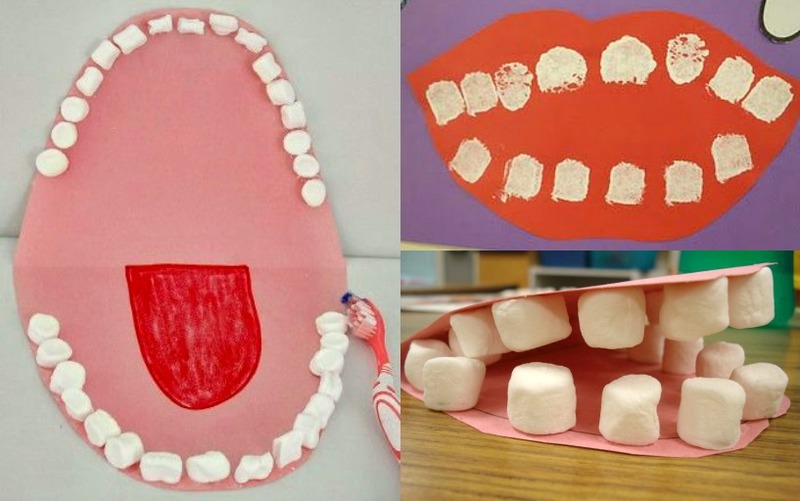 For the craft on the right, simply use scissors to cut a paper plate in half, glue the plate segment to the stick, and then customize the mouth however you like. Will your mouth be missing baby teeth like you, or will it be perfectly straight like the teeth in the top photo? It’s up to you! Be sure to pose with your dentist for a picture, both of you holding up your new paper mouths. The dentist may even want to post the picture to the office’s social media pages for all to see! Remember Perler Beads, the miniature plastic beads that you arrange on a grid and fuse together using an iron? They’re totally cool again, and they make perfect valentines since they can easily be turned into functional magnets or decorative tacks. 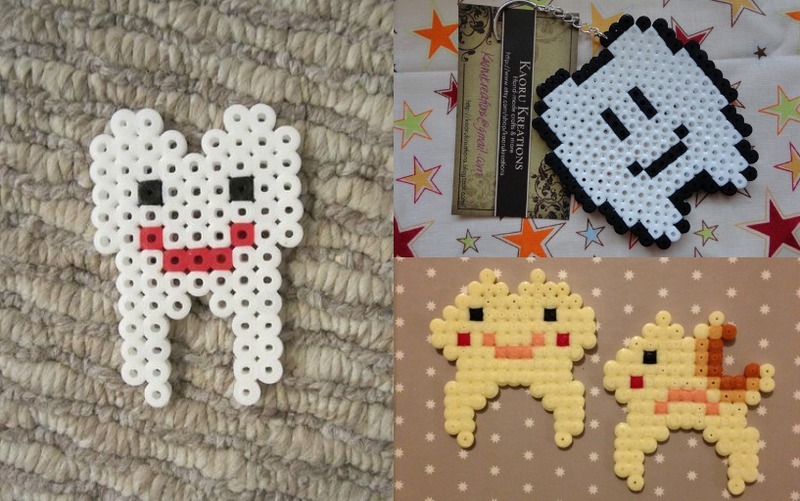 Plus, Perler Beads are great for constructing simple geometric shapes…like teeth! We love the oh-so-easy smiling design on the left, but who could resist the set on the bottom right, which includes one happy tooth and one sad tooth with a cavity – poor little guy. Grab an adult when you’re ready for the ironing stage, and be sure to let the beads cool completely before handling. We love the random/imperfect nature of this craft, and that despite the creative freedom, it still ends up looking chic against a crisp white card stock background. We marked this as a craft best suited for older kids since it requires poking holes with a sharp needle, and a fair amount of manual dexterity for the sewing. 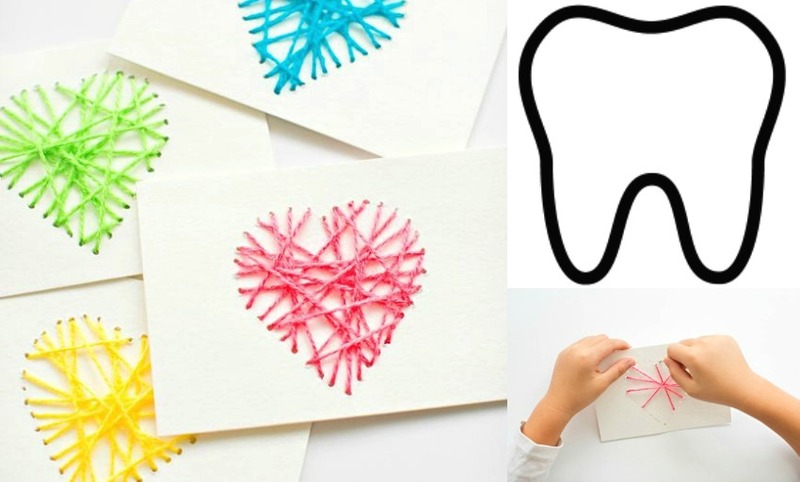 The tutorial above explains how to make a string art heart, but the shape could very easily be adjusted to be a tooth. We’ve included a link to a plain tooth outline if that’s the direction you’d like to go with this charming, yarn-based card. 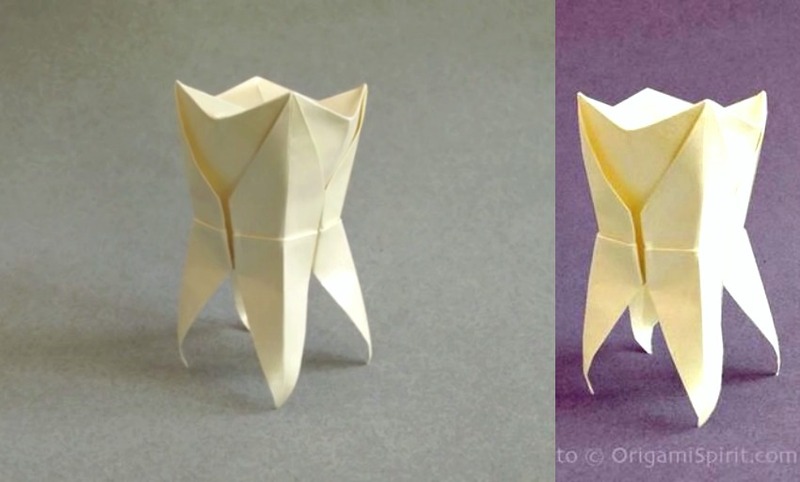 We can’t imagine the amount of patience and attention to detail required to make an origami tooth, but we’d wager there are plenty of folks out there who have the desire and ability to put this together. In fact, the step-by-step video tutorial we linked to above has over 87,000 views, so at least we know there’s interest in the process! We can’t think of a dentist, hygienist, or office manager who wouldn’t appreciate this intricate structure perching atop their desk, and Valentine’s Day is the perfect reason to make it happen. 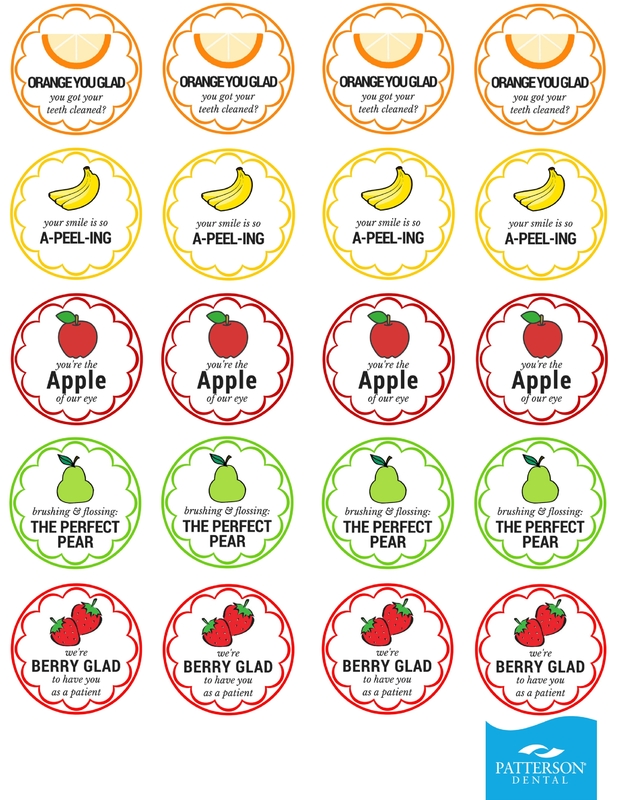 If you don’t plan to have fruit around, the “berry glad” sticker could also be re-purposed by attaching it to a container of berry flavored dental floss, fluoride rinse, or toothpaste! 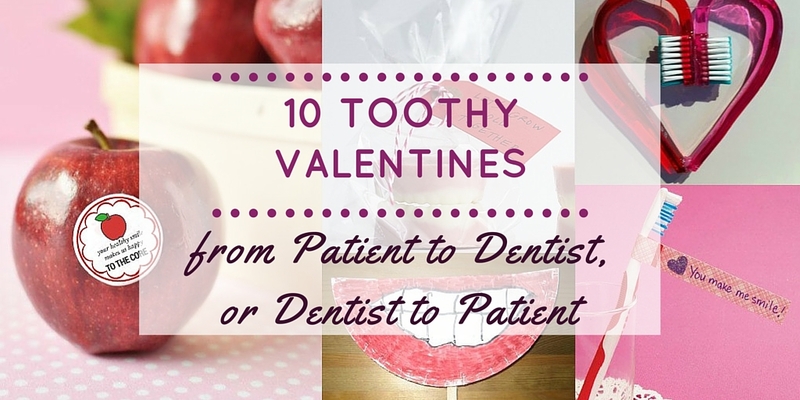 Chances are your practice already sends patients home with new toothbrushes post-appointment, so why not take a few extra minutes and attach sweet Valentine’s Day sentiments to each brush throughout February? 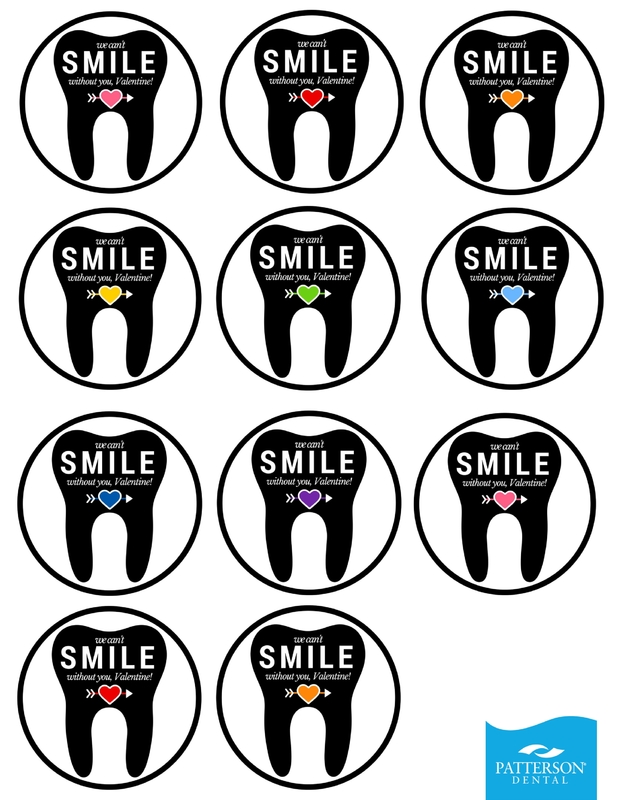 We put together free printable circular tags that read, “We can’t smile without you, Valentine.” As you can see above, the colored hearts match the available colors of our cuztomizable Patterson brand toothbrushes…not a coincidence, hehe. Did you know that toothbrushes are very easy to melt and bend?? Both the adorable toothbrush heart picture above left, and the festive toothbrush bracelets seen in the bottom right, were made using the same technique. Simply bring a pot of water to a boil, carefully drop in the toothbrushes using a pair of tongs, and in seconds the toothbrushes become pliable. 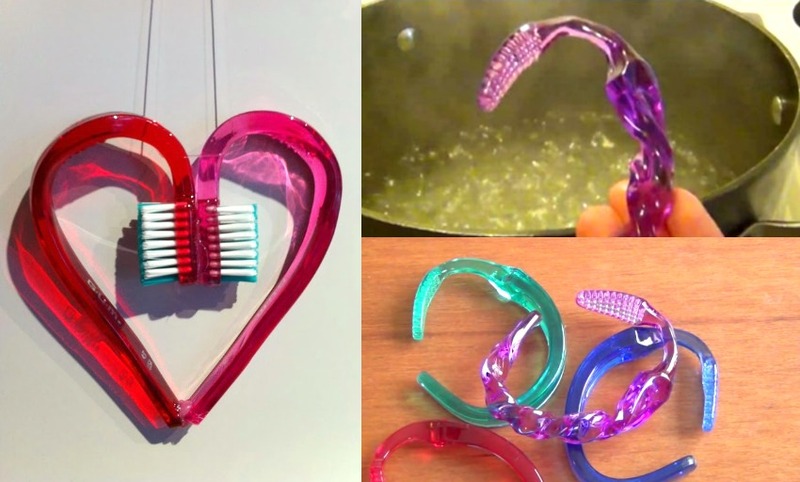 We especially love the idea of the fused toothbrush heart – it could be a door hanger, desk decor, or even something to spruce up a school locker. Whatever decorative purpose it ends up serving, patients will be surprised and delighted to receive a toothbrush from your office in such a different form than they’re accustomed to! 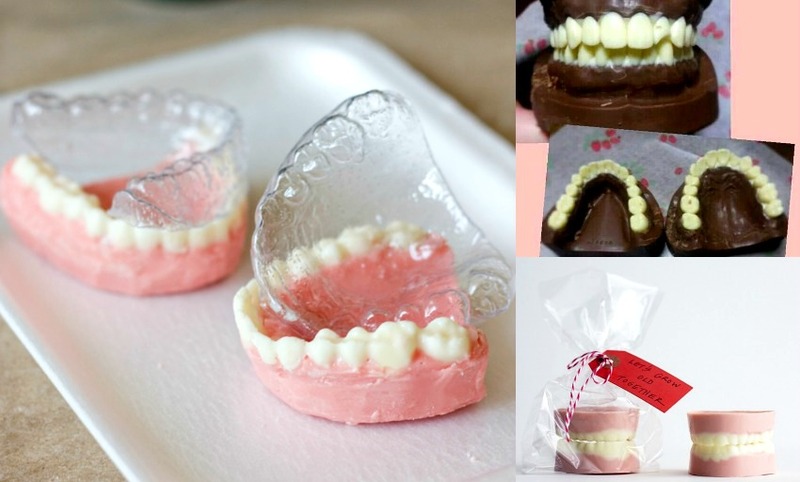 Goodness gracious we can NOT get over how absolutely awesome these chocolate teeth molds are! If you’re in the dental field, you most likely have access to loads of molds that could be used to pour chocolate inside. (For instance, the woman who made the chocolate mold on the left, used their lab’s Vacuform machine, normally used for making impression trays.) Once you have the mold, the rest is surprisingly straight-forward! Just heat up your desired colors of candy melts, pour them into the mold, wait for them to cool, pop them out, and package them in pretty cellophane. 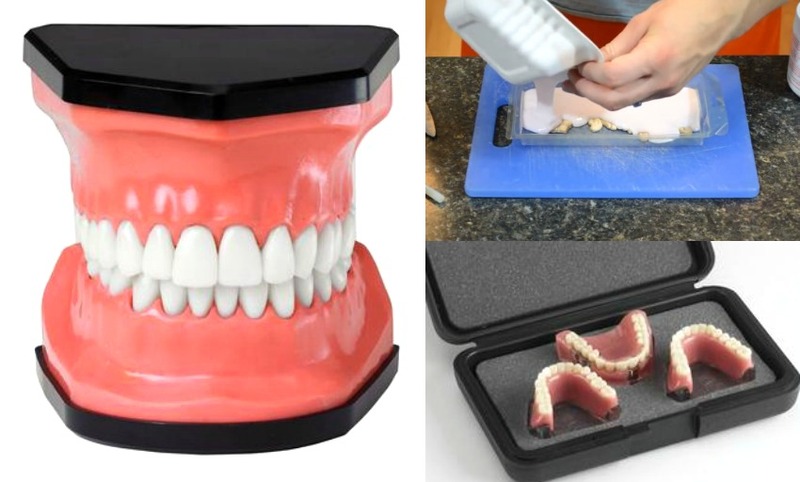 If you’re interested in making your own mouth mold which could be used time and time again for Valentine’s Days to come, the video tutorial linked above explains how to easily make silicone molds from just about anything! Our teeth models above would both be great for this purpose. After all that mold-making and toothbrush boiling, we wanted to end this list with a super easy Valentine’s Day idea. 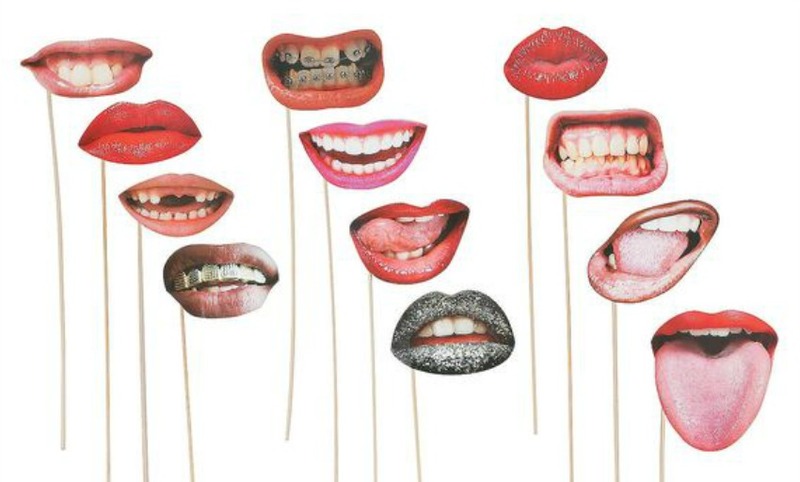 The particular set of paper mouths pictured above are available for purchase online, but they would be SO simple to print out on your own. 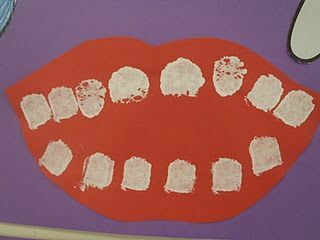 Search google or Pinterest for “silly mouths” or “funny faces,” and print out an assortment of your favorites. 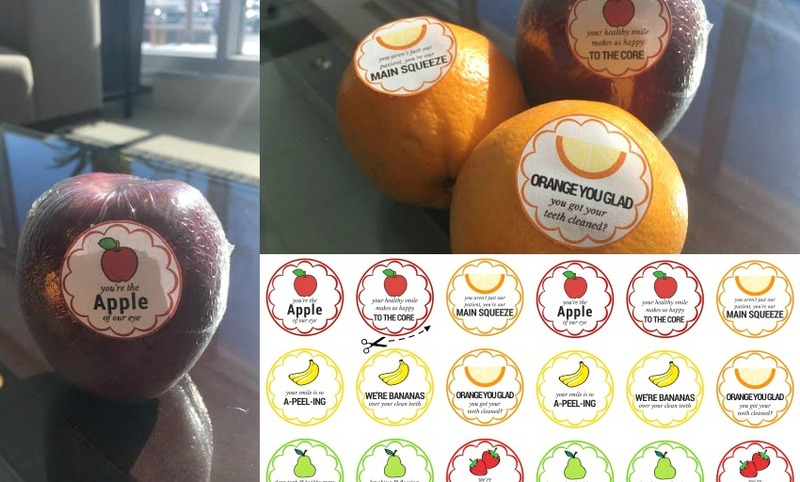 Stick them onto wooden skewers and display them on the front desk for patients to take as they leave. As with the paper plate mouths from earlier, this craft provides a perfect selfie photo opp for both employees and patients, and all of the images can then be posted (with consent, of course) on your practice’s blog and/or social media platforms. What a great way to show how much fun your team has at work! We hope that you found at least one toothy craft on our list that you want to try out this Valentine’s Day, and at least two that made you smile. If you DO make any of these, we’d love to see! Tag us in your photos on social media, including Facebook, Twitter, LinkedIn, or Instagram!